Notice:: Yourmom is going to be moving all email accounts to a new server. The transition will happen in the next few months, and instructions will be sent out via email. 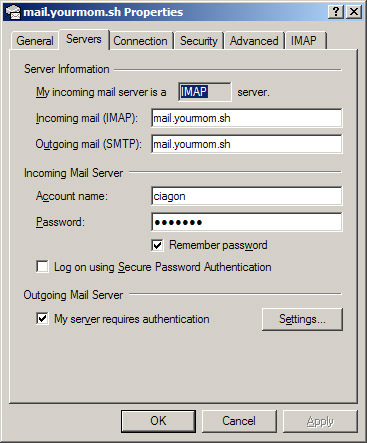 The new mail server will have spam protection and unlimited accounts. Unfortunately, mail filtering will be a little more complicated. If you wish to try out the new server before the manditory deadline, email ehampshire(at)gmail.com.